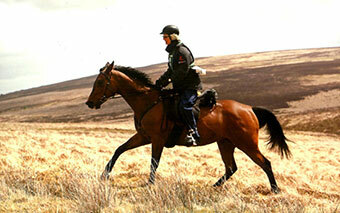 Endurance rider Linda Kidd competed in May’s Golden Horseshoe on Exmoor on Gnocchi (2005 by Grafik x Branta). Despite the very tough conditions, the combination won the Exmoor Stag Cup Two Day 120km class and were awarded Best Condition as the mare finished on a 48/48 heart rate plus good statistics for her muscle tone and dehydration. The pair were mentioned in the Horse & Hound (23/5/2013) write up of the event.